Members of the public can now easily explore almost 30 years of Earth imagery from NASA's Landsat through TIME Magazine's new Timelapse project. The project is a collaborative effort between TIME, Google, NASA and the U.S. Geological Survey (USGS), with the assistance of Carnegie Mellon University's Robotics Institute. As of May 8, visitors to www.time.com/timelapse can access time-lapse imagery from Landsat spanning the years 1984 through 2012. Users can zoom in and out on any spot on the globe and move back and forth in time. The sprouting of Dubai's artificial Palm Islands, the retreat of Alaska's Columbia Glacier and the deforestation of the Brazilian Amazon are among the phenomena that dramatically unfold - at any scale - for visitors to the site. The project improves and expands upon a capability that was added last summer to Google Earth Engine, a platform for accessing satellite imagery. Based on the GigaPan Time Machine technology developed by the Robotics Institute's CREATE Lab and Google, it combined 13 years of Landsat images into a seamless animation that can be interactively explored. Timelapse has extended that tool, providing more years of Landsat imagery and improved imagery. Randy Sargent, a system scientist in the CREATE Lab and a visiting researcher at Google, played a key role in the development. Robotics researchers Paul Dille, Yen-Chia Hsu and Chris Bartley created the viewing software, with contributions from Illah Nourbakhsh, professor of robotics, and others. Sargent and other members of the Timelapse team sifted through more than 2 million Landsat images - a whopping 909 terabytes of data - to find the highest quality, cloudless images of every spot on Earth. These were combined into enormous planetary images, 1.78 terapixels each, for each year. The CREATE Lab researchers then converted the images into seamless animation using the HLML5 language incorporated into browsers such as Google Chrome. Highlight reels of some of the planetary change recorded by Landsat are available at Google Earth Engine. TIME editors also have used the imagery archive to create videos for Timelapse. The Landsat program is an ongoing mission of NASA and the USGS. 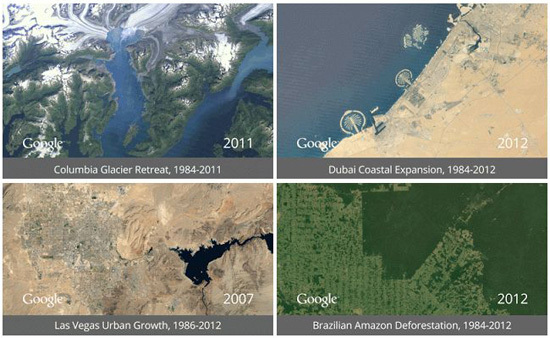 Since 1972, a series of Earth-observing satellites have been circling the globe, taking high-resolution photographs. Though this Landsat imagery is available free to the public, accessing that massive data archive has been cumbersome. The researchers hope the new online tools will help the global community use this resource to better understand the changes that are occurring to the planet.